According to doctors there is no proper medicine or drug that can be taken for treating dyslexia. It is necessary to diagnose the symptoms for dyslexia as early as possible so as to begin with the treatment. 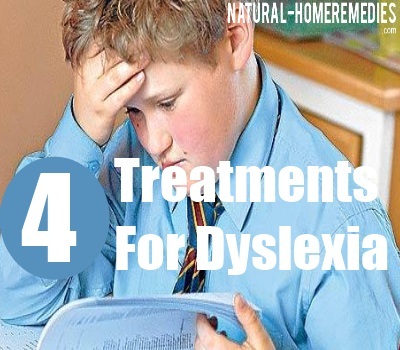 The following treatments can be prescribed for a child suffering from dyslexia. dyslexia is not any physical ailment that can be treated by popping medicines. You can treat this reading disorder by imparting education on it and also by educating yourself. In this form of treatment the teacher who will be assigned the responsibility of looking after the dyslexic children is given some specific training pertaining to the requirements of these special kids. The teacher will be given training using touch, sight and hearing therapy that will be implemented on the child to help him or her in reading. The methods used can be in the form of understanding letters or words using a finger. These specialists will look after improving your child’s capacity to recognize the phonemes or the smallest sound that can form a word. The specialist will also conduct session for reading aloud that will help the child in improving the pronunciations as well as comprehensions of the words. During this therapy course the parents of the dyslexic child must also contribute in the treatment. You must assist the teacher by providing timely feedbacks and improvement results of your child. The parents can contribute here by using simple homely procedures. They can blindfold their child and ask him to identify letters and say it out loudly. They can also ask the child to identify letters written with colors such as crayons. This would help to retain the interest of the child and make the treatment easier. Phonemic awareness helps the child in recognizing the sounds or phonemes of spoken words. This treatment also focuses at changing the phonemes and helping the child in identifying the different patterns of words so formed. The child will be taught to produce sounds of printed words to improve their pronunciations. The child will also be taught to spell and write to improve comprehensions. In this treatment the child will be trained to improve his or her capacity in understanding and remembering vocabulary. The parents will be trained to help the child learn his or her vocabulary. These trainings will be provided by the language specialists. In fluency training sessions the dyslexic child will be trained to read aloud and write the words after identifying them. This process would help in strengthening the fluency of the child over a particular language. These would be multiple sessions of reading aloud, identifying words and sounds, sessions on phonemes etc. Dyslexia can be cured by working on the brain. When these sessions will be conducted simultaneously there will be increased pressure on the weak areas of the brain that disrupt the reading abilities. These sessions will help in improving the fluency of the child and thus improve the reading ability.